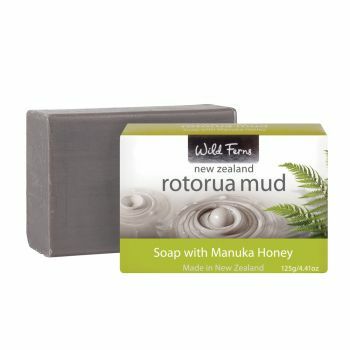 Wild Ferns Rotorua Mud and Manuka Honey Soap 125gr/4.41oz. New Zealand Rotorua Mud Soap with Manuka Honey. A gentle soap containing pure natural Rotorua Thermal Mud and Manuka Honey. The unique properties of these ingredients will cleanse, protect and heal the skin. This mud soap was introduced to me in New Zealand. The Rotorua mud is known for its cleansing, purifying properties. This soap is great for any skin type, and great for problem skin. Smells really nice, too.